Ten Commandments of Car Line Etiquette. Thou shalt not activate thine mobile communication device. Yea, even shalt thou disable it whilst in car line. Thou shalt avoid all communication with thy offspring’s instructional personnel whilst in car line. Thou shalt hold such sessions at times and locations other than car line. Thou shalt not exit thine vehicle whilst in car line. Thou shalt obey this rule, lo throughout the day: sunrise, sunset. Thou, therefore, shant leave thine vehicle unattended in the car line regardless of how early thine arrival. In the event that circumstances demand thine exit, thou must place thine vehicle in a designated parking space. Thou shalt obey rule number three, even if thine offspring is carrying a satchel, a lyre, and hand-crafted graven images. The size of said graven image is irrelevant when adhering to this rule. Plan thusly. Thou shalt zip* the zipper. Neither shalt thou avoid it, nor shalt thy prevent it. Zipping is a sacred practice that shall not be broken. Zip, less thou be unzipped, so help you God. 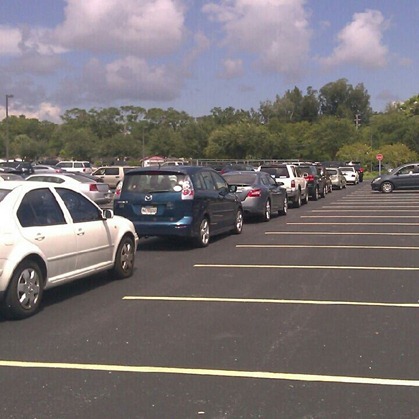 Thou shalt practice adherence to school policies regarding car line flow. Thou shalt remember that the rules set forth do, indeed, apply to thine actions, yea even as they doth apply to the actions of others. Thou shalt not allow thine offspring to exit thine vehicle prior to arriving at designated exit areas. Thou shalt refer to commandment number seven if thou doth not comprehend this directive. Thou shalt not drive around barriers that have been situated thusly to prevent thine passage. Thou shalt wait thine turn. Thou shalt eliminate all space betwixt thine vehicle and the vehicle situated before thine. Thou shalt avoid leaving vehicle-sized gaps betwixt the vehicle of thine and that of thine bretheren. Thou shalt pull ahead such that the zipper may continue to zip. Feel free to distribute at will. And you're welcome. *Zip (verb) [zĭp]—the practice of taking turns while in car line. When two lines of traffic enter the car line from opposing directions, one car enters from one line then another enters from the other line, thus creating a zipper of cars.